The story of ‘Brandy‘ began when she was brought into me by the rangers afterhours one friday afternoon. They had been trying to track her down for a month. Many concerned citizens had been calling them about her whenever she was spotted dragging her hindlegs behind her. The firt time I looked at Brandy, I saw her beautiful face and her body that looked like a pile of bones. I then noticed that one of her hindlegs had an open fracture and the other had the hock joint completely exposed. She looked like an absolute mess. The rangers handed her to me and said: ‘You’re the vet. Please do what you think is best for her as she is a stray dog’. That meant I had the authority to put her down on humane grounds if I felt her injuries were beyond repair. I took a deep breathe and started to thoroughly examine her wounds. She was so brave and did not once attempt to lash out at me even though she was in a world of pain. I decided to give her palliative care overnight and xray her in the morning. I gave her an epidural as pain relief, cleaned her wounds, bandaged her legs and started her on iv fluids. I also fed her and, needless to say, she swallowed her food in a heartbeat. The next morning, I opened her cage and she blew me away. She just jumped out and started walking on her two frontlimbs without any hestitation or balance issues. Her backlegs did not touch the ground for one second. She had developed a completely new way to walk and it was so admirable. At that moment, I knew I could never give up on her and I hoped that she had no spinal damage. We then had to sedate her to get appropriate xrays as it required us to stretch her out. The xrays confirmed a fracture in the obvious leg with bones sticking out but also ruled out any other fractures. That was a huge relief. We then thoroughly cleaned all her wounds and rebandaged both her legs. We could not operate on her until we got consent from her owners or until she was officially declared an unclaimed stray. The next morning, a lady came in and informed us that she had owned Brandy for only 24 hours. Brandy had escaped her property that had very high fencing one week ago and consequently incured her injuries. She was her 5th owner and that was the only background history she was given. All this lady knew was that Brandy was the most beautiful natured dog she had ever met. When she called Brandy’s previous owners to warn them that she may well be on her way back to them, she was outraged with what they told her. They chose to only tell her then that Brandy hated being left alone. She could not afford paying for any of the surgeries required and so we requested she surrender Brandy to us. 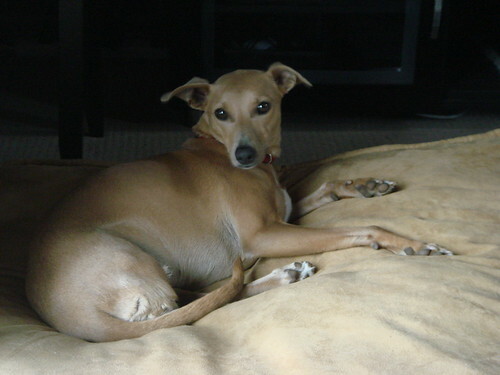 At that stage, we had no real indication if any surgeries would be succesful in saving one or both of Brandy‘s hindlegs. My bosses had witnessed the way Brandy walked and immediately understood why we had to give this dog a chance. Bruce proceeded with plating her open fracture and it took him 4 hours of very labour intensive surgery. It was a very challenging task to replace the bones into their normal position. After one week, Brandy had attached herself to me and would start whimpering whenever I had to leave her at the clinic after work. At that stage, I decided to take her home and start the rehabilitation process. When I first took her home, my dogs were not so welcoming; they chose to pretend she did not exist but they eventually came around. I could not leave her at home either because she would ‘kick up a stink’ and my husband could not console her. She simply wanted to be with me all the time. This meant she would come into work with me every morning and go home with me every night. During her first week with me, I noticed that inspite of me pumping her with lots of food, it was going straight out of her. She would produce piles and piles of horse poo. Her body was not absorbing a single nutrient because of how malnourished she was. Bruce recommended I add a few supplements like enzyplex (pancreatic enzymes) to her diet that aid in digestion and that worked a treat. Her first few bandage changes filled us with hope because both wounds seemed to be healing very nicely. But disaster struck after 10 days. 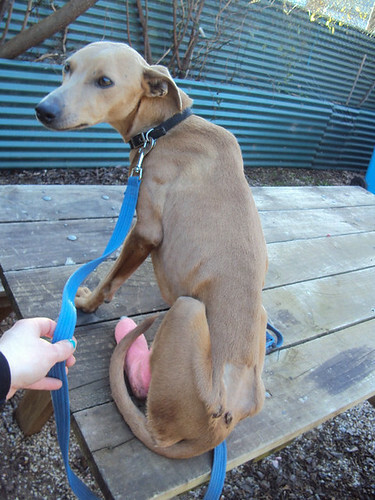 Brandy started looking really sad and miserable and was very hesitant to put any weight on her plated leg. Upon examining her plated leg, we noticed the skin sloughing off and she had no feeling in it. That leg was not viable and had to come off. That posed a huge dilemma for us at that stage because her other back leg was far from stable. The whole hock joint was exposed dorsally and so all the ligaments and tendons supporting that joint were also gone. If we amputated her backleg, it meant she would put all the pressure on the other leg which could prevent its healing. If we couldn’t save one of her backlegs, that posed a serious ethical predicament for us. We had no choice but to press on and amputate the plated leg. Shockingly, she recovered really well from the surgery and was actually much brighter after losing the dud leg. She was still used walking on her frontlegs so she did not put too much pressure on her backleg. We regularly applied Manuka honey and Jelonet on her exposed hock followed by a very robust supportive bandage (Robert Jones bandage). We would be changing her dressings and bandage every 2-3 days. It took about 3-4 months for her wound to completely heal. However, she was still very hesitant to use that hindleg at that stage. I started to take her out with my dogs for regular short walks. She would use her back leg every 3rd or 4th stride for couple of steps then carry it the rest of the way. I resorted to using pulse therapy of antiinflammatories incase there was an underlying painful stimulus. That seemed to help and she started to gain confidence in using her leg more and more each day. At that stage, Brandy was part of my family. She had fallen in love with my husband and my dogs. Unfortunatley she had also developed the habbit of chasing Shepo amidst his high jumps and I was mortified he would land on her frail little hindleg one day and that would be the end of her. Whenever I used to throw the ball around for my dogs, I would keep Brandy indoors to prevent any injuries. One day she snuck out and there she was sprinting across the backyard taunting Shepo while he chased after the ball. In that moment, I felt so truimphant, happy and relieved that I never gave up on this beautiful survivor. So I set out to find her a new suitable home and I did not have to go very far. She was adopted by one of our staff member’s moms. She clicked with her two new whippet mates and adapted to a life full of pampering. I was banned from seeing her for the first few months because she was pretty unsettled the first couple of days of moving into her new home. When we eventually met, it was an absolutely brilliant reunion because Brandy was psyched to see me yet very obviously besotted with her new owner. Ah Brandy, the thought of her always makes me smile. Every animal teaches me something and she taught me never to give up hope. Erin (her mom is the proud owner of brandy now) was kind enough to send me recent footage of Brandy running around on her three legs. Enjoy. ← Meet my support system! Dr Rayya I have enjoyed reading through some of your posts, especially this one on Brandy. I came across your blog from a mutual blogger freiend Jodi Stone and I am very glad I decided to check your blog out, I am looking forward to following your journey!